Monitoring weight change of children with SAM in outpatient care has been recommended: static weight or weight loss for 2 consecutive visits alerts the need for a home visit or other follow-up and for 3 consecutive visits alerts the need for in-patient referral. There has been a lot of recommendations on this forum for using MUAC cutoffs only (+ oedema status) as admittance and discharge criteria for children with SAM to outpatient care - rather than weight-for-height z-score cut offs (+ oedema status). Along these same lines, would the recommendations above extend to monitoring MUAC changes and trigger decision making (ie. static MUAC or MUAC loss for 2 consecutive visits alerts the need for a home visit or other follow-up and for 3 consecutive visits alerts the need for in-patient referral)? Or is this redundant as weight is still taken (as it is used to calculate RUTF quantities) and therefore that should just be monitored in MUAC only programs? We weigh child at every follow up visit. It is unfortunate but we discontinue RTUTF in children with weight loss or no weight gain at follow up visits. If the child is ill- they are referred to inpatient. But if the child is in the same health and exhibits no increase in weight- often the child is not receiving the RTUTF. We have found it sometimes is being sold or given to someone else. Once the word is out the villagers understand that the protocol needs to be followed. We are moving forward on these issues. 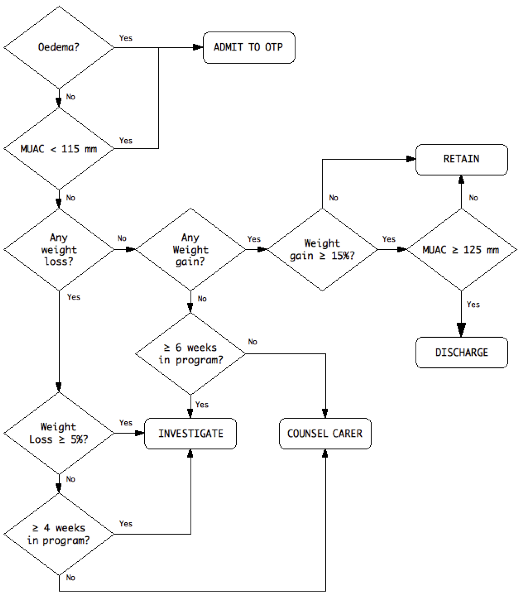 There are a couple of PRJ articles (from MSF programs) on using MUAC as a discharge criteria showing that it resolves the issue of the most severe cases getting the least treatment (and vice-versa) that is present when using proportional weight gain. A study in Malawi looking at post-discharge survival and relapse has just stopped. This will be written up soon. The key results is that MUAC >= 125 mm is a safe discharge level. MUAC for monitoring is the next thing to look at. Analysis of data from a CONCERN program first presented at the Washington CMAM meeting (and at other meetings after that) shows MUAC and weight responding to treatment in very similar ways. This suggest that it is possible to use MUAC for monitoring. The main issue is to develop and test algorithms (as you have above) for alerts. This could be done using program data. The data from the CONCERN program (above) and from the Malawi study could be used for this. Also of interest for this application is Mike Golden's suggestion for a new (wider) MUAC strap design. The idea is that this will reduce error / variability associated with finding the mid-point of the upper arm and with different strengths of pull. 1. When you say 2 consecutive static weights/MUAC readings what is the interval between the 2 follow ups? What would you recommend after discharge from an Outpatient programme as a good follow up programme? For how long/ how frequently? 2. In a setting where Outpatient management of s SAM is not possible/ not allowed with RUTF are there studies which show use of MUAC criteria of discharge as effective? 3. What is this wide MUAC tape which can diminish errors? Can we please have a reference? (1)(a) I did not mention "2 consecutive ..." but it is a good point that you make. I have data for weekly and fortnightly visits. 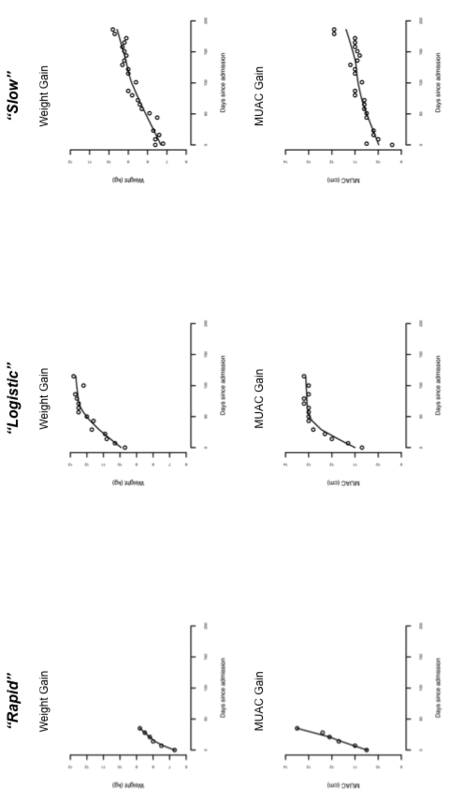 I am thinking of a visual approach to monitoring with (e.g.) thrive lines like on a growth chart (MUAC on the vertical axis and WEEK on the horizontal axis). An alert would be raised when a thrive line was crossed. Just an idea. (1)(b) I would not recommend routine follow-up after discharge unless you have a strong network of community based volunteers. I have done this for research purposes only. I followed up every fortnight for three months. (2) No idea. I would not expect it to be different from CMAM since TFC and CMAM both deliver an F100 based diet and children would be discharged clinically well with MUAC >= 125 mm from both programs. (3) This was suggested by Professor Mike Golden at a recent ENN meeting on MUAC issues. I think it is a good idea. There are (as far as I know) no straps of this design currently available. I think that some development and testing is required. Question then relating to this discussion: Is there a major difference in rate of change in MUAC for SAM versus MAM cases? If MUAC cutoffs can be used for discharge in CMAM programs treating SAM, can MUAC effectively be used for discharge in any programming activities that are treating MAM/working to prevent SAM? Or is MUAC not sensitive enough to be used in this way during recovery (specifically of MAM cases)? Any and all assistance greatly appreciated. The presented data are courtesy of Save the Children (US). There is, I think, no good reason to suppose that response of the MAM child will be much different from this (i.e. we will see a classical growth curve) although we might expect slower rates of gain in SFPs due to lower energy densities of the food given (an argument for RUSF), more inter-household sharing of porridge type products, and the absence of a systemic antimicrobial (which is also a growth promoter) in SFP protocols. I think that response of the MAM child to treatment deserves further research and may lead to a revision of MAM protocols towards (e.g.) a lower intensity OTP protocol. If MUAC cutoffs can be used for discharge in CMAM programs treating SAM, can MUAC effectively be used for discharge in any programming activities that are treating MAM/working to prevent SAM? I do not see why not. In SAM cases we are moving towards a MUAC >= 125 mm (for two consecutive visits) discharge threshold. Recent studies (in press) show (1) that this is a safe threshold for discharge in the sense that post-discharge relapse and death rates rates are below 5% and (2) discharging children before this is unsafe in the sense that relapse and death are more common in children with MUAC < 125 mm even if W/H targets are met. It seems to me that the same threshold could be used for MAM cases. MUAC < 115 mm -> Refer to OTP. This monitoring protocol is presented for illustration purposes only.